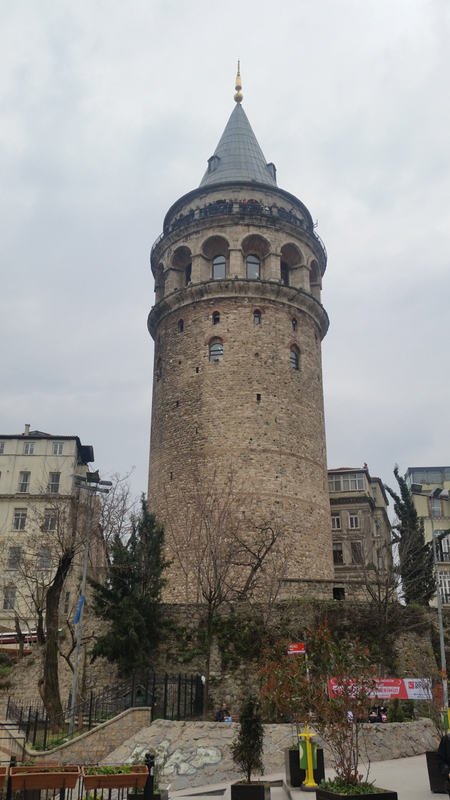 The travel to Istanbul was uneventful, save for the fact that I was harboring a rather expense item in my backpack and I was a little bit worried I might get asked questions about it, which could ruin the surprise, or worse that I might have to deal with customs over ‘importing’ an expense item. In the end it was nothing was noticed though! We arrived late on Friday night. Our AirBnB host, Mert, was super cool and was waiting at his apartment a little after midnight when we finally got dropped at his place. 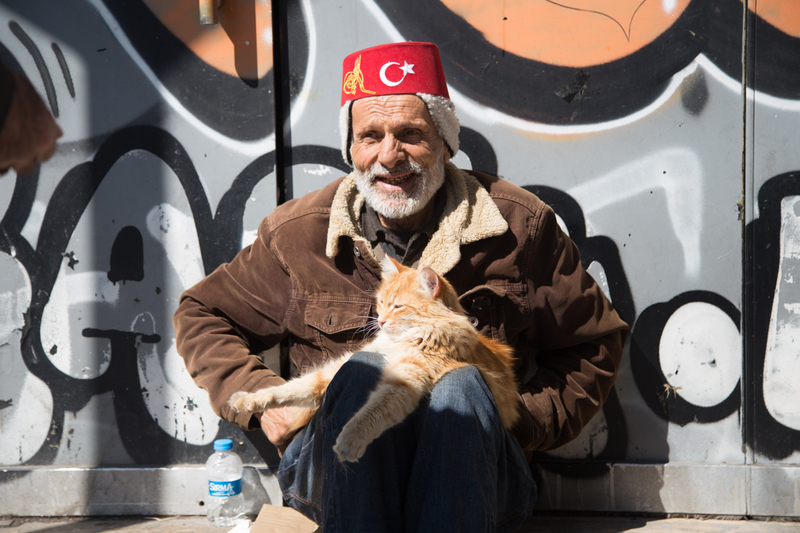 Mert was very accommodating and he had a simple apartment right in the heart of a part of Istanbul called Beyoglu, the center of which is Taksim Square. Donna’s Turkish friends at INSEAD recommended this neighborhood and it really was an awesome area to stay. There were copious little shops of all kinds, like quaint bookstores and antique dealers, as well as many cafes, bars, and in general a very bohemian and youthful vibe. 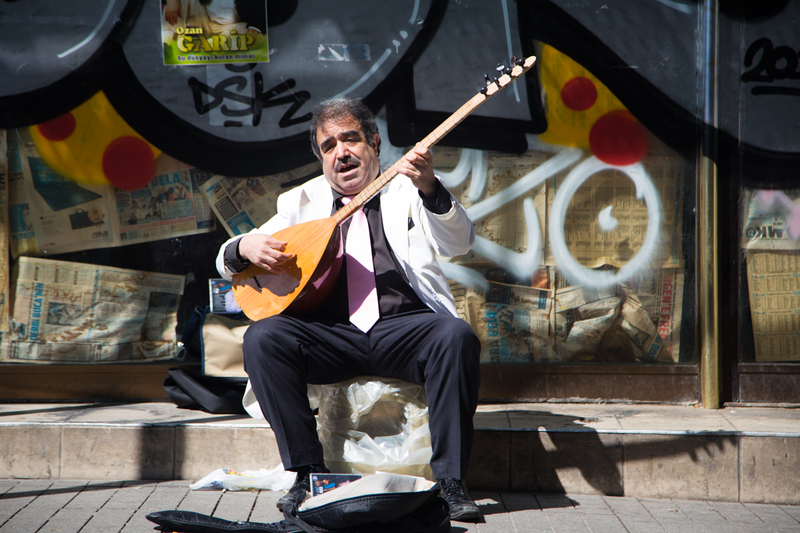 Taksim is definitely the spot to plant oneself for a stay in Istanbul. 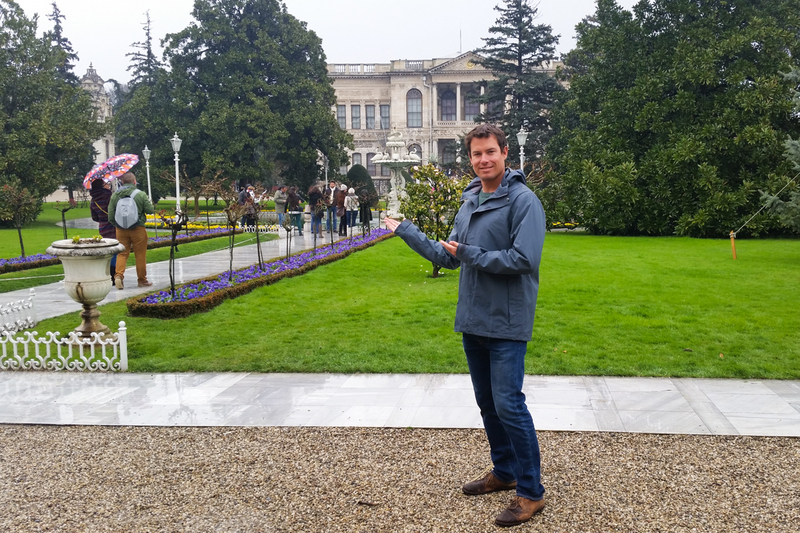 Our first day in Turkey was kind of gloomy and drizzly but we made the most of it. 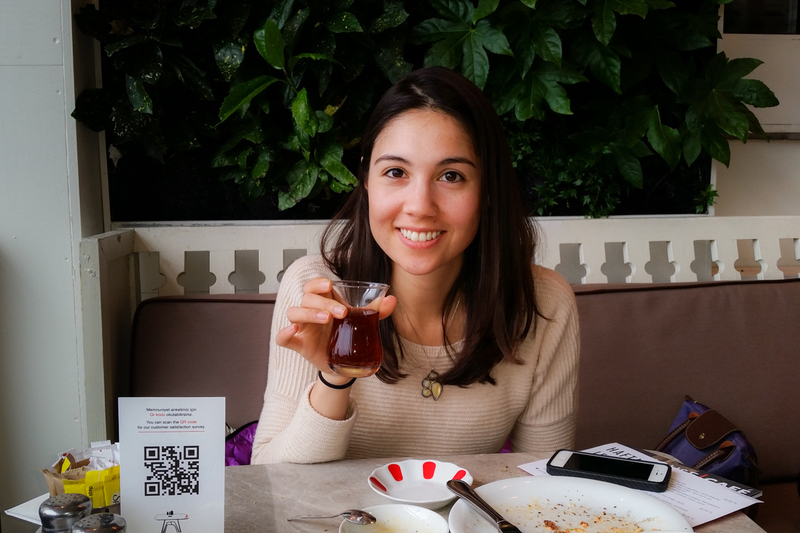 We started off by heading over to Ortakoy where we had a Turkish breakfast at the House Café. 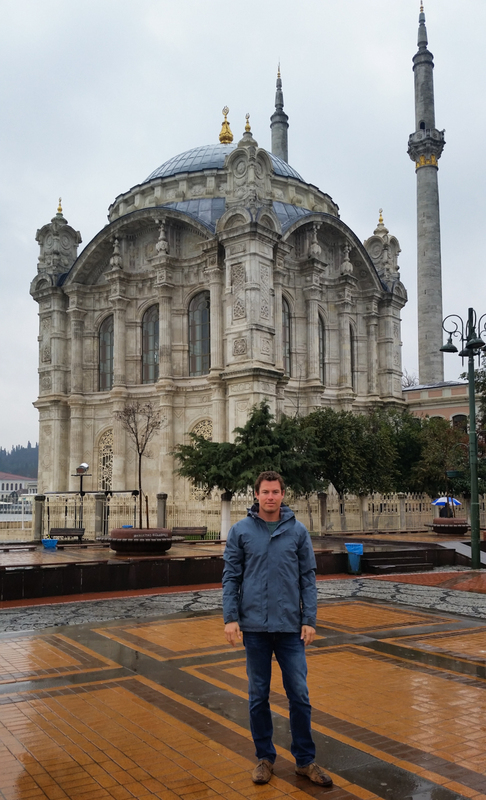 Just outside was the beautiful Ortakoy Mosque, the first of many amazing mosques that I’d see in Istanbul. After breakfast we walked along the main boulevard south towards the Karakoy part of town with the plan to check out the Museum of Modern Art. 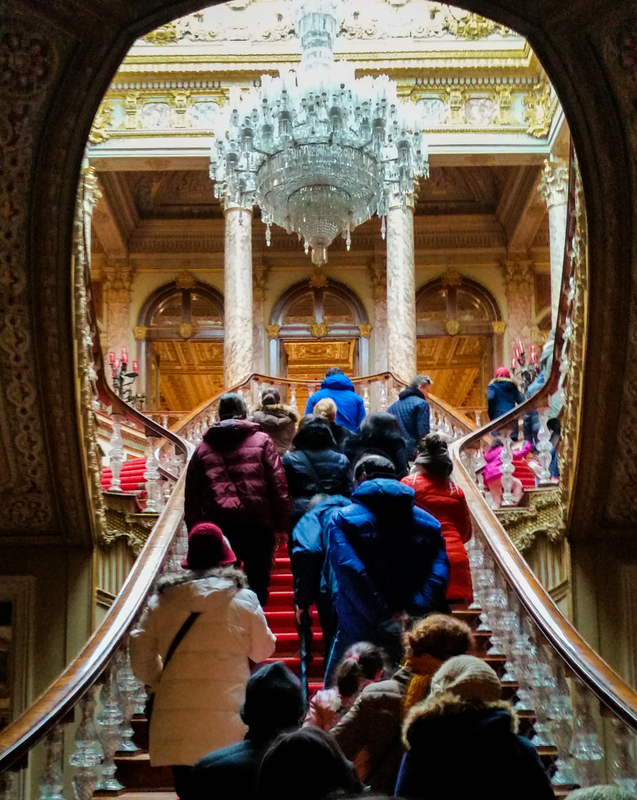 Along the way we happened to pass the Dolmabahçe Palace, which was built in the mid 1800s as the primary residence and place of business for the Ottoman Sultans and their families. 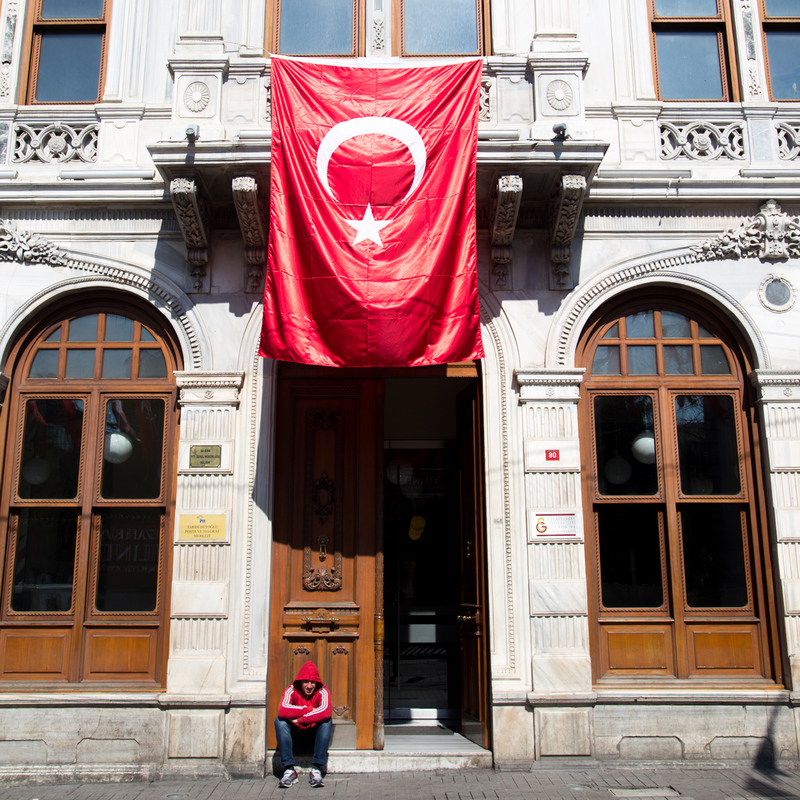 The Sultans occupied it until the Turkish independence in the 1920s and then Atatürk, the first president of Turkey, lived there. Part of the tour had us walk through the room where Atatürk passed away. 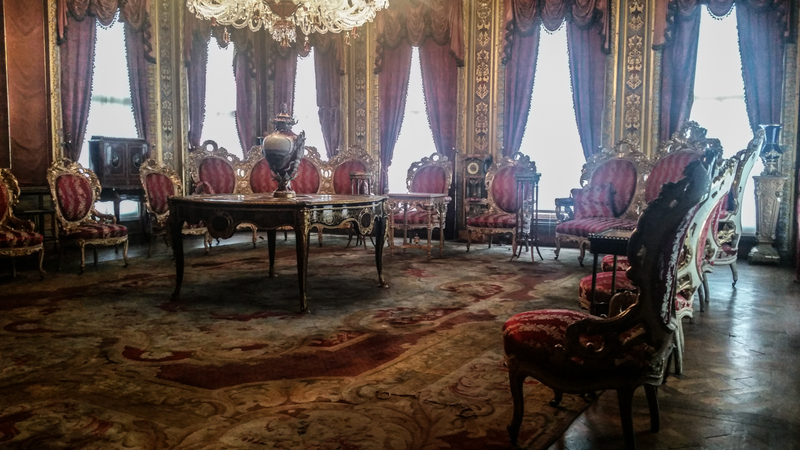 The Palace was amazingly ornate, with gold plating everywhere, elaborate Turkish rugs, and a generally Baroque style. We were not permitted to take photos inside, but I managed to sneak a few anyway. 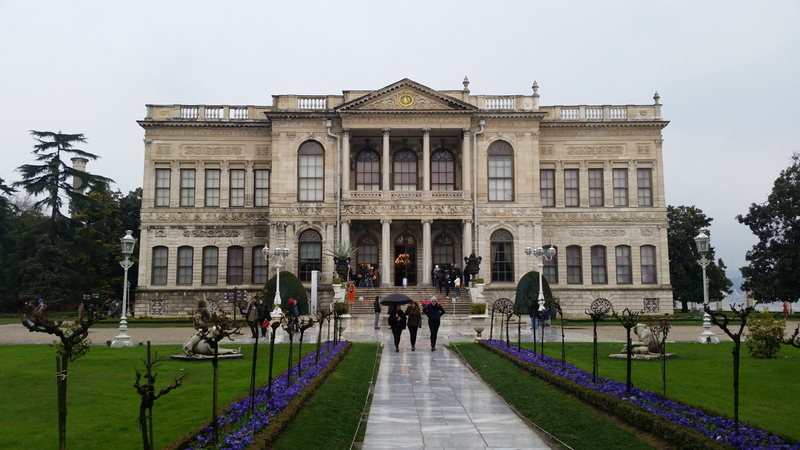 Front and center view of the Dolmabahçe Palace. 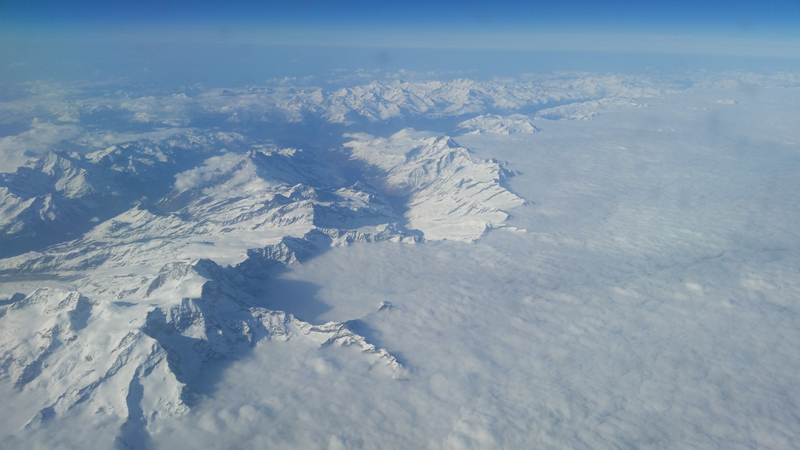 It’s way, way longer than it looks from this vantage point. We eventually made it to the Museum of Modern Art, but it was closing soon so we just hung out and had a small meal at the restaurant. 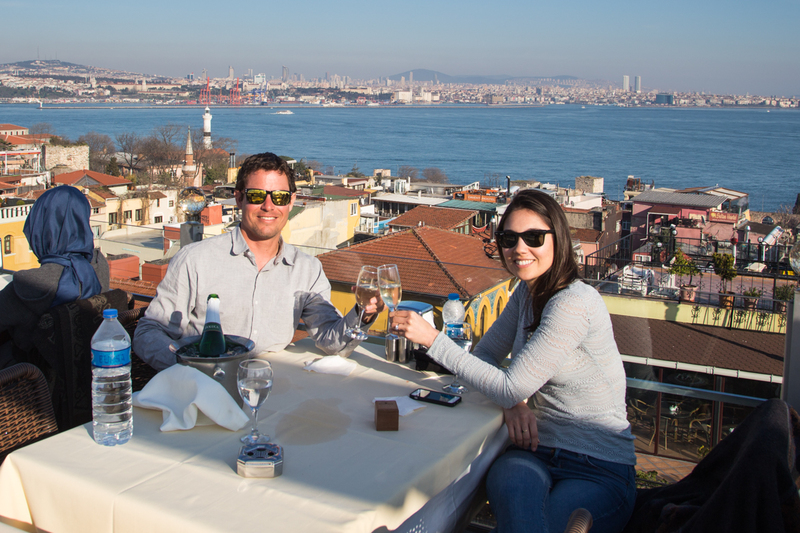 The museum has a fantastic vista over the water, where we could see the Asia side of Istanbul across the river to the east and then look south to Old Historic Istanbul, where the Grand Bazaar, the Old Palace, and the Blue Mosque are located. 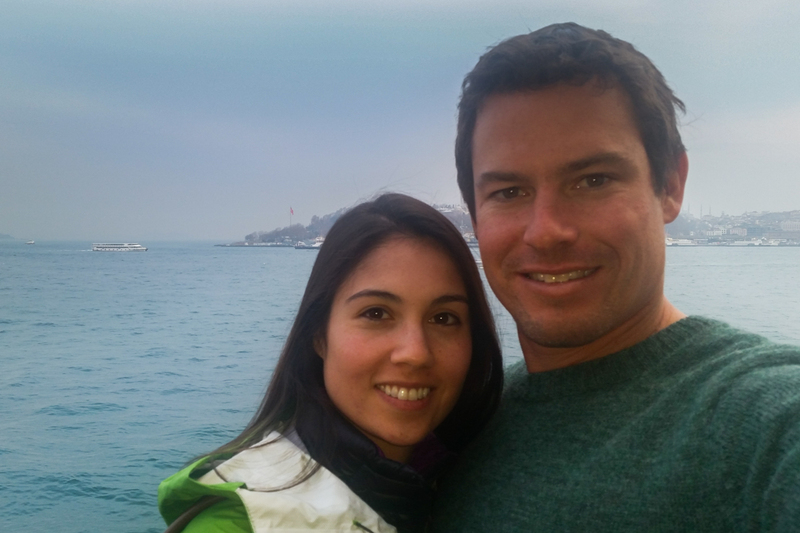 Bosphorus Straight selfie, taken from the balcony behind the restaurant of the Istanbul Museum of Modern Art. 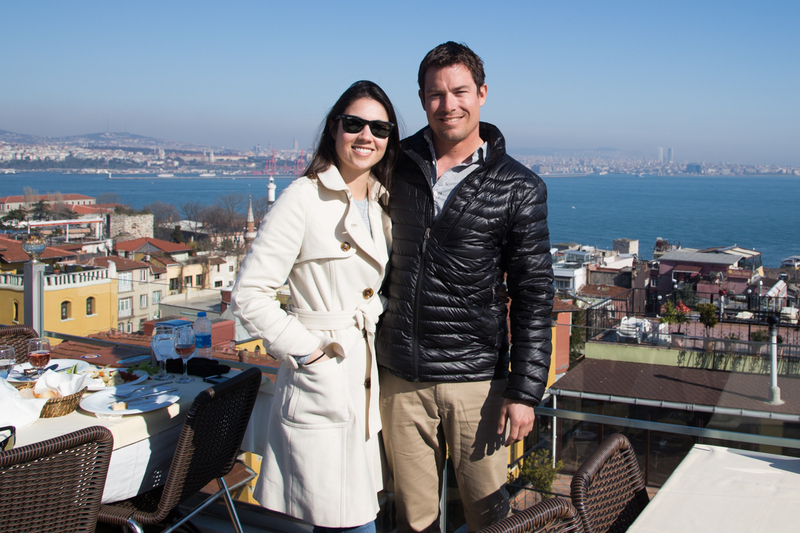 Behind us is Old Istanbul. That evening we chilled out and explored Taksim. 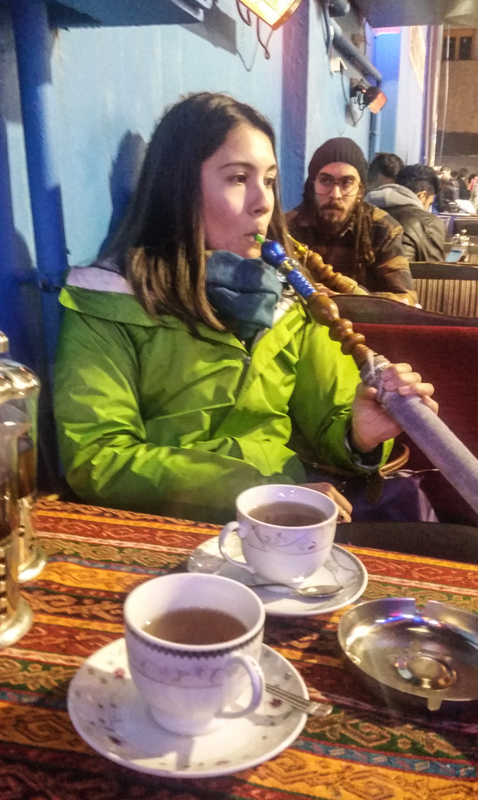 Donna was very interested in buying various kinds of baklava and I dragged her to a hookah bar. It was a Saturday night and the place was buzzing with people shopping, drinking at cafes and bars, and enjoying the nightlife. 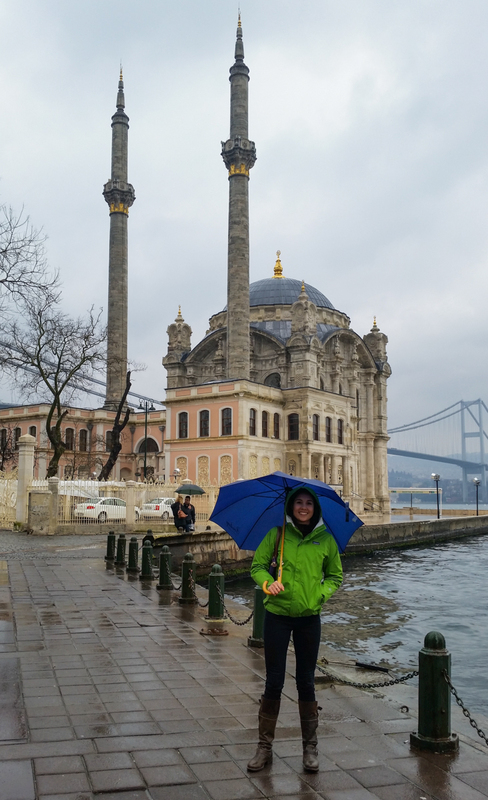 I highly recommend touring much of Istanbul on foot. We ended up walking almost everywhere for our two full days in town and it was a great call. There is also a subway for longer transits and taxis aren’t that expensive either, but we covered most the ground on foot and were rewarded by happen-chancing upon so many random and interesting places! Sunday was the day. The sky was clear and blue and our plan was to head to the old part of Istanbul and see the Grand Bazaar and the Blue Mosque. I knew what I had to do, so I discreetly threw the expensive box inside my backpack and kind of made sure it was down toward the bottom where it would be hardly noticed. 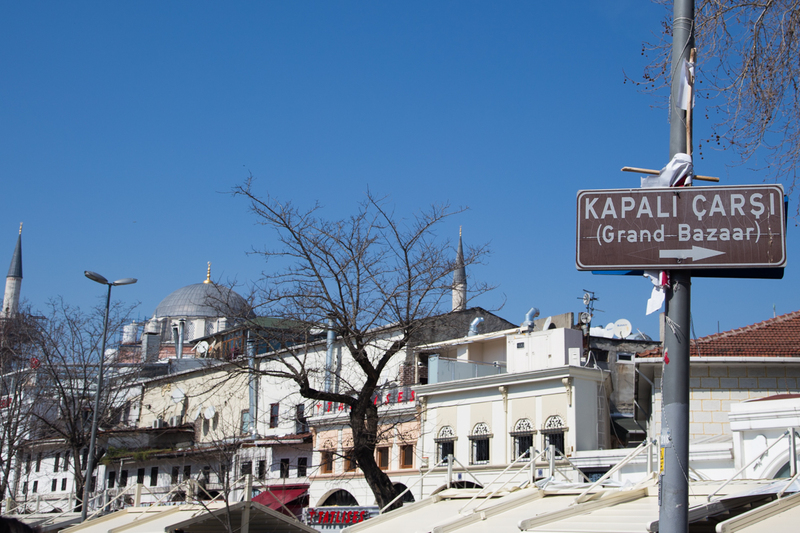 We figured out the subway system and emerged about a 45-minute walk from the Grand Bazaar. What we didn’t realize was that the Grand Bazaar is closed on Sundays, so we got skunked from seeing it! No worries, though, plenty more to see. Lots of street vendors in the Old Istanbul area. 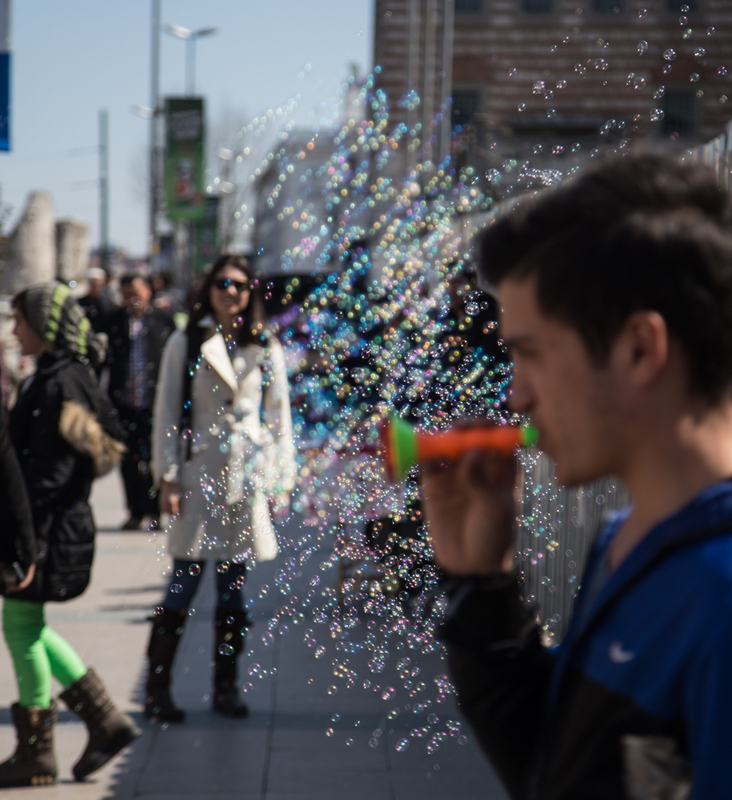 I like this unique shot of Donna watching a guy blowing hundreds of little bubbles. Tracking down the Grand Bazaar. Unfortunately, we learned it is closed on Sundays! 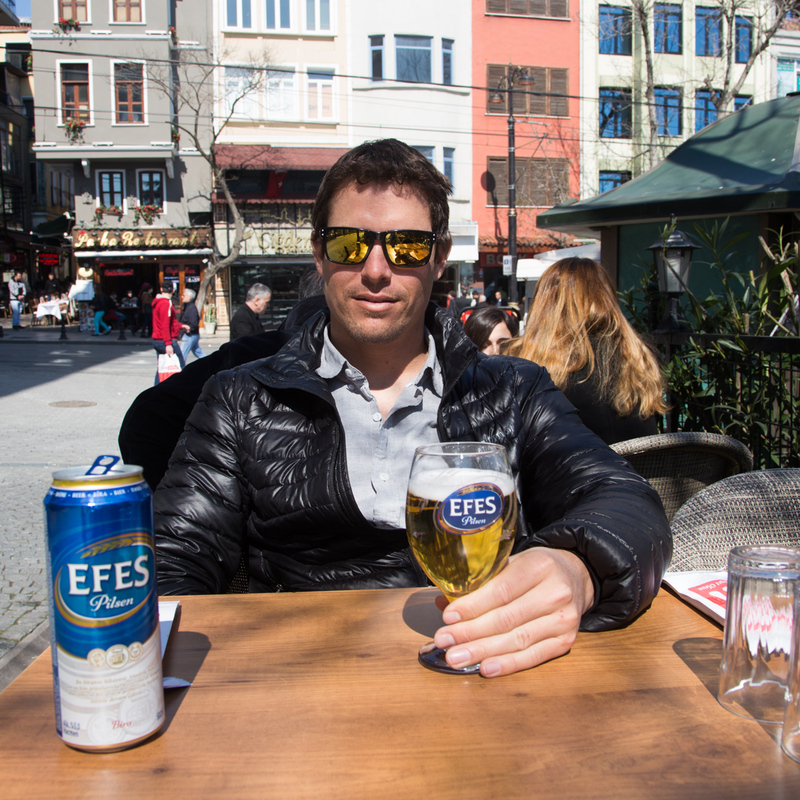 We continued on foot and had a small bite to eat and a beer in the sun near the Blue Mosque. Originally we tried a different café a little closer to the mosque but they didn’t serve alcohol at that spot; I had almost forgot that alcohol is against proper Muslim rules! 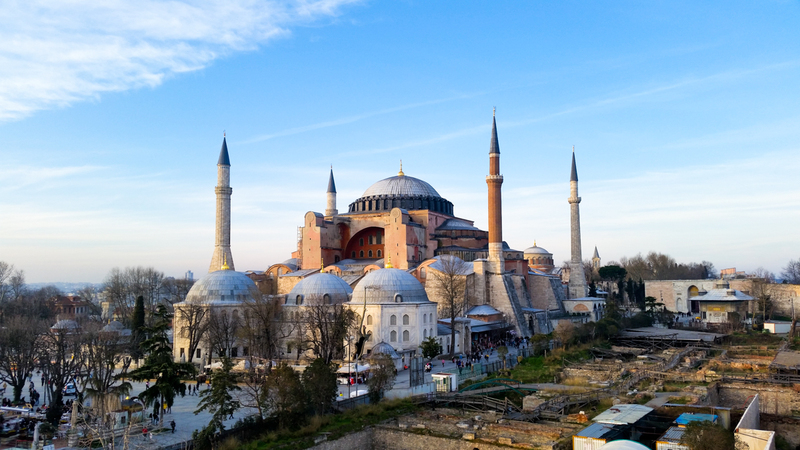 We thought about going into the Hagia Sofia, which is right across from the Blue Mosque, but there was a long line and learned that is was actually a museum now (and before that was a Christian church and before that a mosque… only Istanbul!) Hmm, onward to the Blue Mosque where we did the walking tour through it. 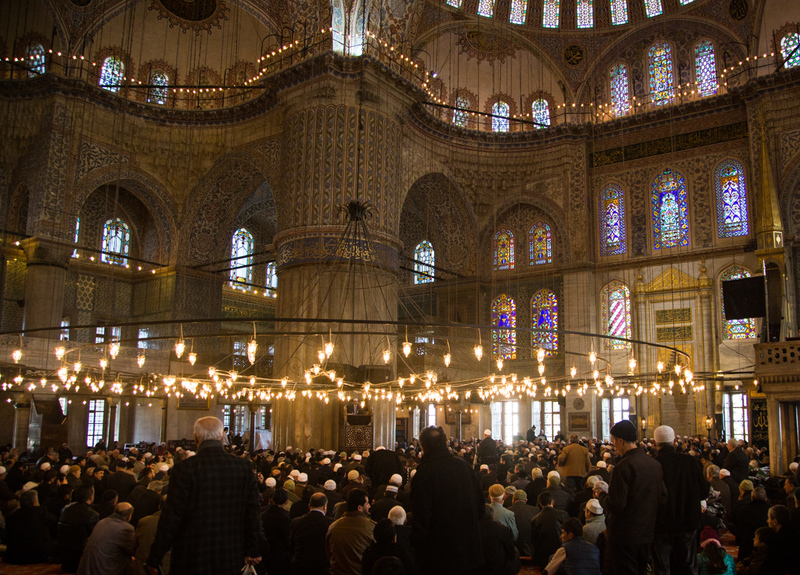 There was a live prayer going on and this was my first mosque experience. 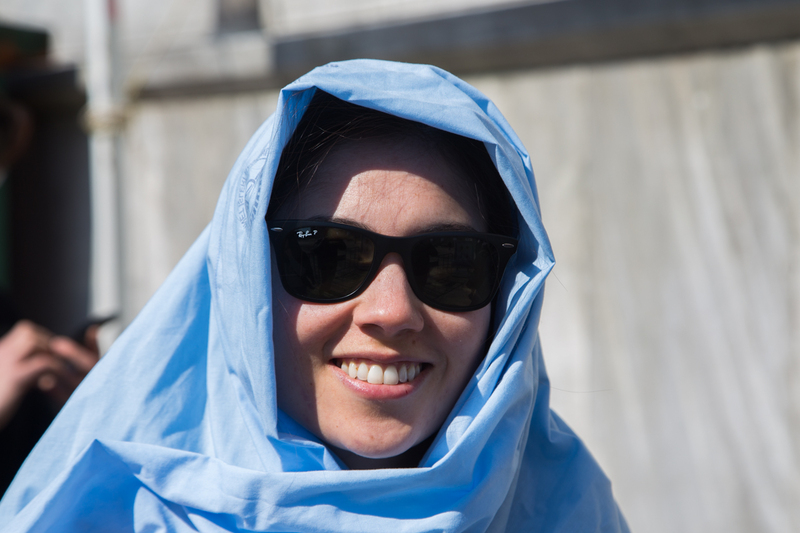 Donna had to wear a headscarf when entering the Blue Mosque. Also, we both had to take off our shoes. By this point it was mid-afternoon and absolutely gorgeous. I knew I needed to execute my plan sooner than later, but where? I hadn’t really planned anything out, but I obviously wanted to find a picturesque and romantic setting to pop the question. 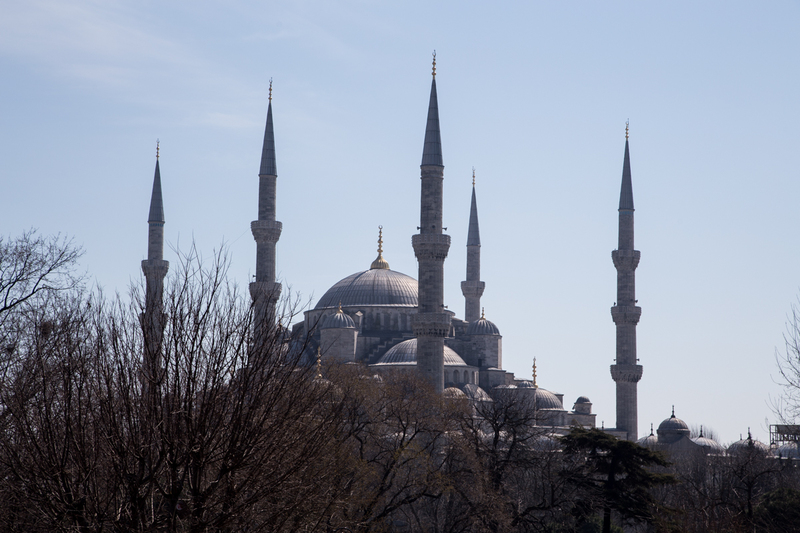 We ended up meandering away from the Blue Mosque towards the Mediterranean Sea. I noticed that there were a lot of rooftop restaurants in the area and this seemed promising. I scanned the skyline and eventually found the one that I deemed to be the tallest, a place called The Seven Hills Restaurant. 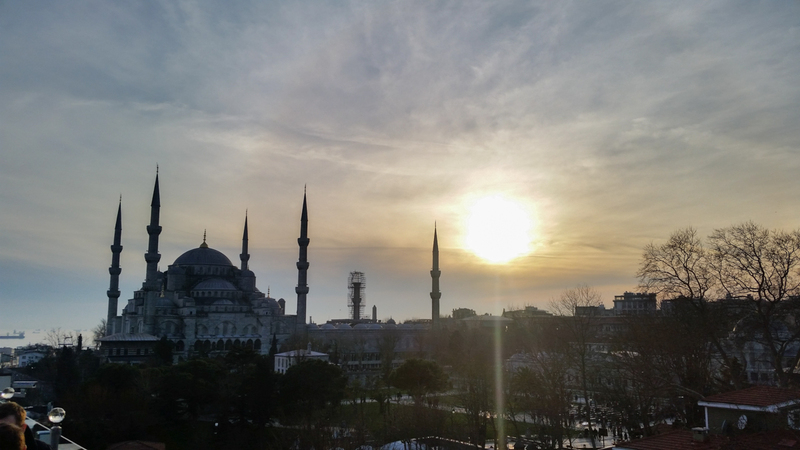 We went up to the 10th floor and the terrace had a splendid panoramic view of the water, the Blue Mosque and the Hagia Sofia. This would be it. I told Donna that we should get a photo together using my Canon 6D SLR camera and obviously she thought that was a great idea. I set the camera to the correct settings and then I walked over to the restaurant manager, who was standing sufficiently far away from our table, and I asked him if I could propose to my girlfriend in his restaurant. He replied “yes” and then I told him I’d like him to take photos with my camera and he agreed. I told him that the plan would work like this: first Donna and I would pose for a normal photo, then I would walk over him, check that the photo exposure was good, and that then I would walk back for another photo and that’s when I’d propose. He nodded his head and we executed the plan. I wasn’t really that nervous as it happened, I’d been planning this for a while and was excited to get engaged to Donna. She’s so amazing! (But you already knew that, right?) 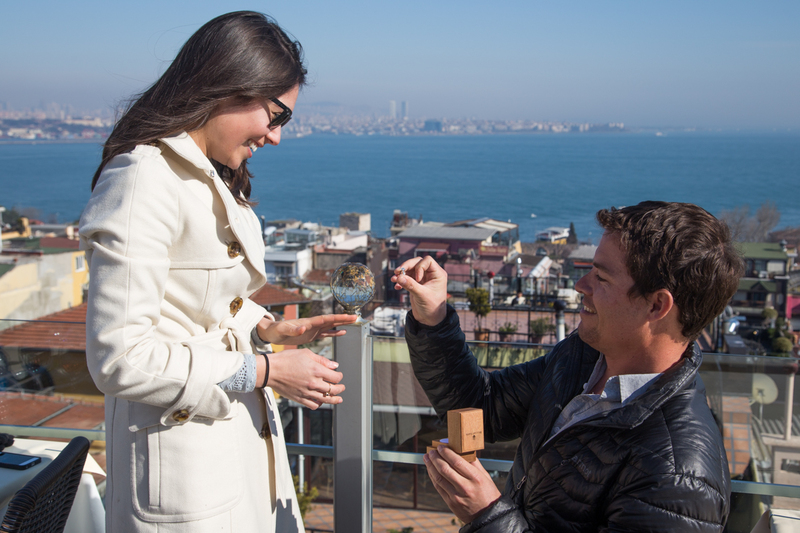 All of the sudden I’m down on one knee and holding a box with her ring in it. 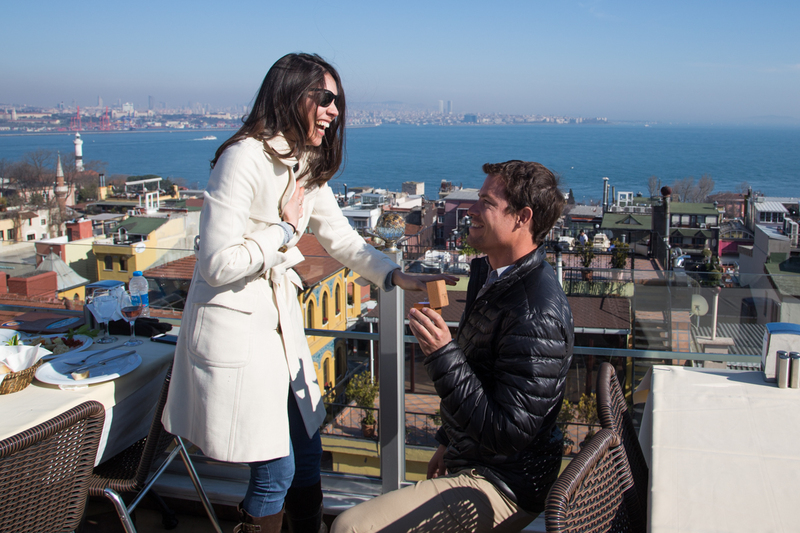 It was classic: I totally surprised her as I asked, “Donna, will you marry me?” The restaurant manager captured her surprise awesomely in one photo! Donna was ecstatic and in went in for an embrace and a kiss, but at some point I had to remind her that she needed to give me an answer! 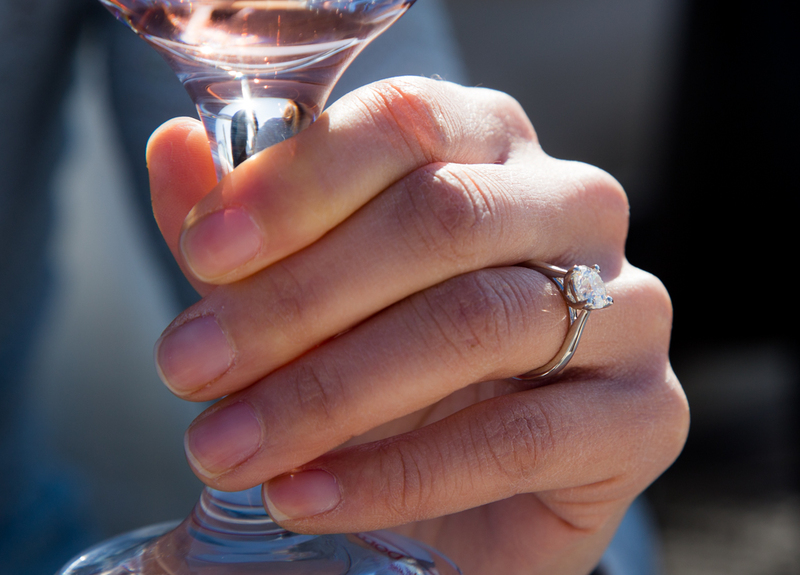 She said “yes” and then I put the ring on her finger. By this point we had become the center of attention as most of the other guests at the restaurant realized what was going on. I stood up and gave her another kiss and then everyone let out applause. I claimed it at one point, raising our hands in the air, haha! And that was how the most important moment of my life happened! 1) Clearly she is surprised! 4) I remind her that she has to give me an answer! 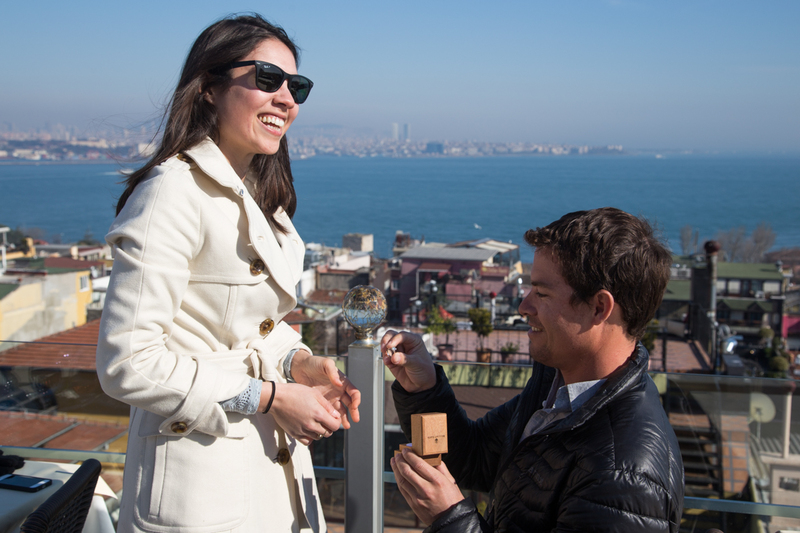 Little did I know that sunny March day in Istanbul would bring one of the best surprises of my life. 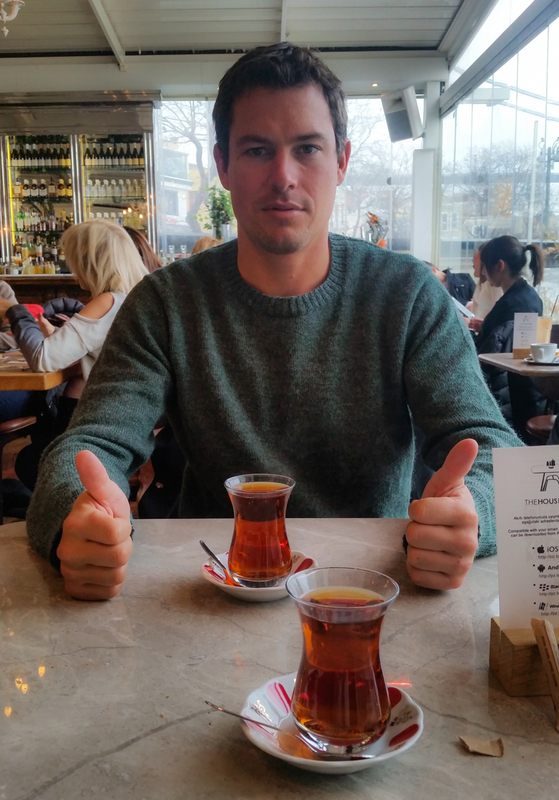 I had wanted to visit Istanbul for a long time and thought it would be a nice way to say goodbye to Brandon since he would be leaving France for the next 2.5 months to surf in Chile and San Francisco. What I expected to be a chilled, fun, exploratory long weekend getaway to a city I had heard so many great things about, turned into a moment that I will so vividly remember forever. I was completely surprised that during one of our photos on a gorgeous rooftop overlooking the Mediterranean Sea, I found Brandon getting down on one knee with an opened ring box in his hand… I was so stunned that I couldn’t process what was happening and didn’t have an immediate response for him. I sort of just froze. He had just come back from over a month of living in the French Alps snowboarding, so how in the world did he manage to score a ring and actually bring it to Istanbul?! Turns out it took a lot of effort, coordination and planning. For so many reasons, I am so in love with this man and so excited for our life together! The rest of the day was a little blurry and a lot of fun. 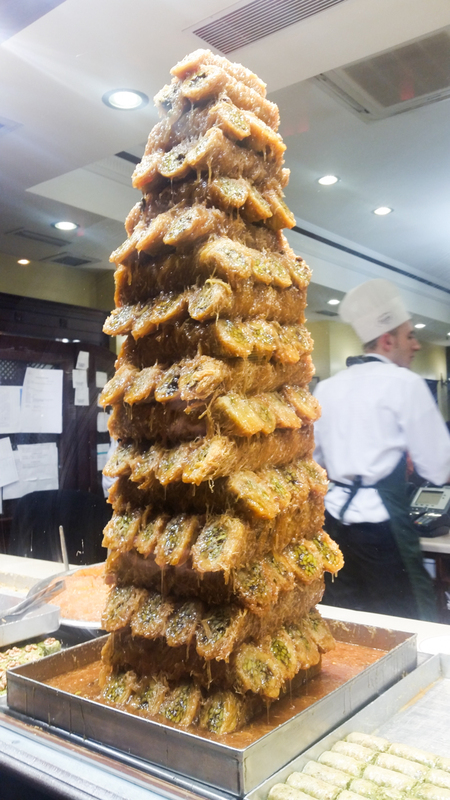 We ordered a bottle of champagne and finished it, and then walked all the way back to Taksim. It was a long and beautiful walk and we were jittery with excitement fantasizing about our future life together. By the time we got back we were exhausted and we ended up not going out that evening, instead Donna wanted to call some of her friends and family and let them know the good news. I also called my mom, dad and sister. Whew, what an amazing day! The next day it was time to go, but we did get a chance to cruise and have a nice breakfast alongIstiklal Street in Beyoglu. We caught a taxi back to the airport and flew back to Paris. Mission accomplished! !